We get you started so you can sustain Recess Rocks in your community. low-cost and non-invasive way to help schools and organizations offer seamless integration of heart-healthy exercise into scheduled recess periods, teachers’ class-time lessons, and other times throughout the day. Children benefit with improved physical condition; heightened energy and excitement for their schoolwork; a solid foundation for life-enhancing, healthy habits; and greater awareness and desire for the rewards physical activity provides. Recess Rocks achieves these goals with its four programs: Recess, Active Classroom, Celebrations! and Training for teachers and movement instructors. Somatic language that supports children’s sense of their bodies ("fold," "slide," "pop," "shiver" and "melt") and continuous movement that allows children to express what they see are integral to the Recess Rocks experience. School communities, organizations (e.g., family resource/wellness centers, churches or youth clubs), PTOs/PTAs and movement instructors are encouraged to launch Recess Rocks using a free, detailed Implementation Guide, along with free detailed classes, activities and demonstrative videos. 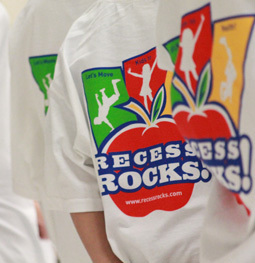 Using these materials, teachers and/or movement instructors have sufficient information to understand the Recess Rocks philosophy and method, and lead classes and activities. Those wanting to learn more are invited to explore customized training opportunities. Schools and organizations that hire movement instructors help support the local economy. Movement instructors heighten children’s awareness and desire for fitness and learning, as well as help improve their physical condition. Children have more energy and excitement for their schoolwork, plus physical activity improves academic performance. and the engaging tools Recess Rocks provides to enhance their teaching experience. In turn, teachers increase the learning level in their classrooms, which has a positive impact on the dynamic energy and well-being of the school. Plus teachers improve their cognitive health, reduce their stress and get a burst of energy from joining the physical activity. Recess Rocks is part of another special community, that of its parent organization, Community Health Center, Inc. (CHC). CHC has a long history of providing health services—including obesity prevention—to communities throughout Connecticut and is thrilled to serve its national community through the Recess Rocks programs. (1) In Connecticut, the program's impact has been significant. A 2009 evaluation of the program by Yale University School of Medicine shows increases in physical activity and healthier food and beverage choices made by children after participating in the program.